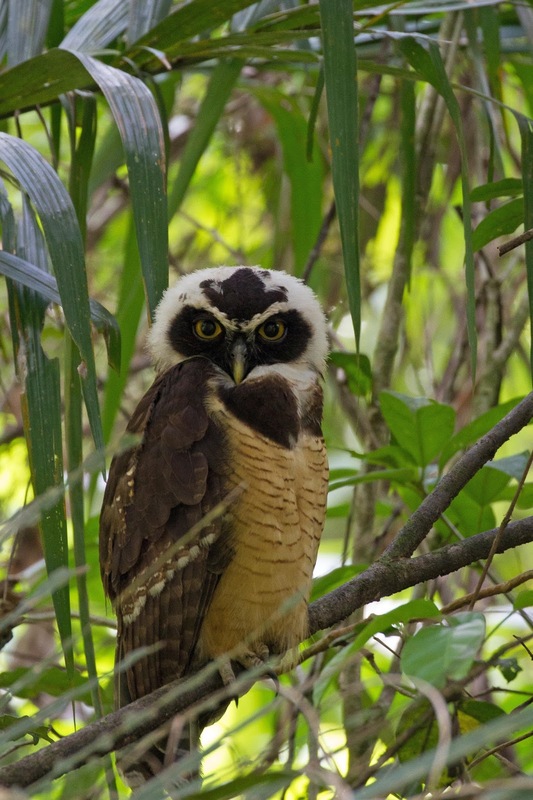 Philly Bird Nerd : Owls! When preparing for a trip to a new place such as Honduras, the first thing that I do is buy a field guide for that area. When the book arrives in the mail, I flip through the pages and wonder how many of these birds we will actually see on the trip. 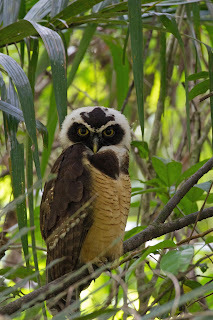 When I get to the owl section, I get kind of bummed out because there are so many cool owls in Central America and I know that we will probably not see them. On our other trips to Belize and Costa Rica, we saw exactly one owl - Ferruginous Pygmy Owl which is cute, but certainly not the most exotic owl on the planet. This trip was different. On the bus ride from the airport to Pico Bonito, our guide Alex asked each person to tell him what bird(s) they would most like to see on the trip. When it came my turn, I said Resplendent Quetzal, Potoo and any owl possible. He wrote each person's targets down in a little book. On the way back to the airport, he read each person's list and didn't miss any - including my owls. 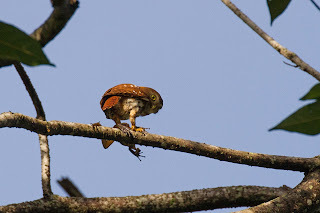 We spotted our old friend the Ferruginous Pygmy Owl flying around the gardens at Pico Bonito Lodge at breakfast on our first morning. Honestly, we couldn't miss it. He perched in a tree hooting. He flew to another tree and we could see that he had something in his talons. A unlucky frog for breakfast. You can see the frog legs dangling here. 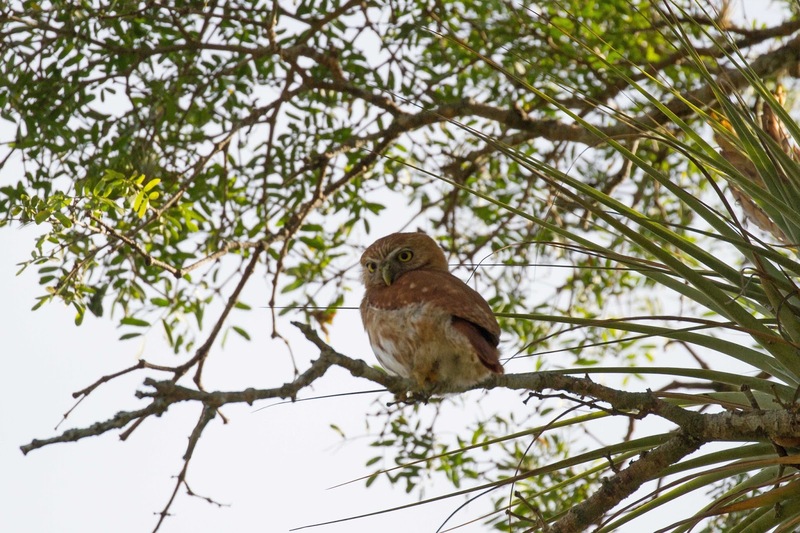 We subsequently saw 3 or 4 other Pygmy Owls including this one in the desert. We headed to another resort called Rio Santiago one morning. 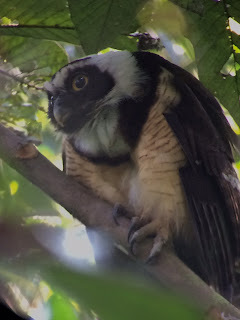 The attraction here are hundreds of hummingbirds, however the resort had another surprise waiting for us along the trail - Spectacled Owl. 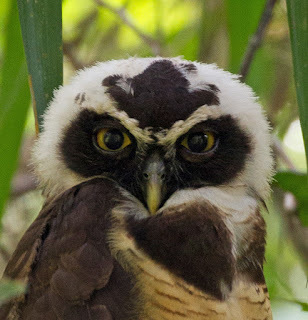 This is one of the owls that I dreamed about while flipping through the field guide. 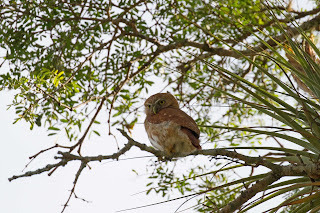 The owl was skittish, so we had to be very quiet and move slowly along the trail. Alex set up the scope and called us one by one to see the owl. 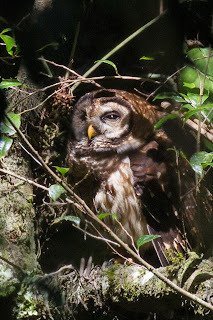 We walked the trail again after lunch and the owl was still there. He was calmer and didn't seem to mind us peering at him through the scope and camera lenses. You can see why they call this owl Spectacled. I would have been a happy camper if we didn't see another owl the rest of the trip. That wasn't the case though. 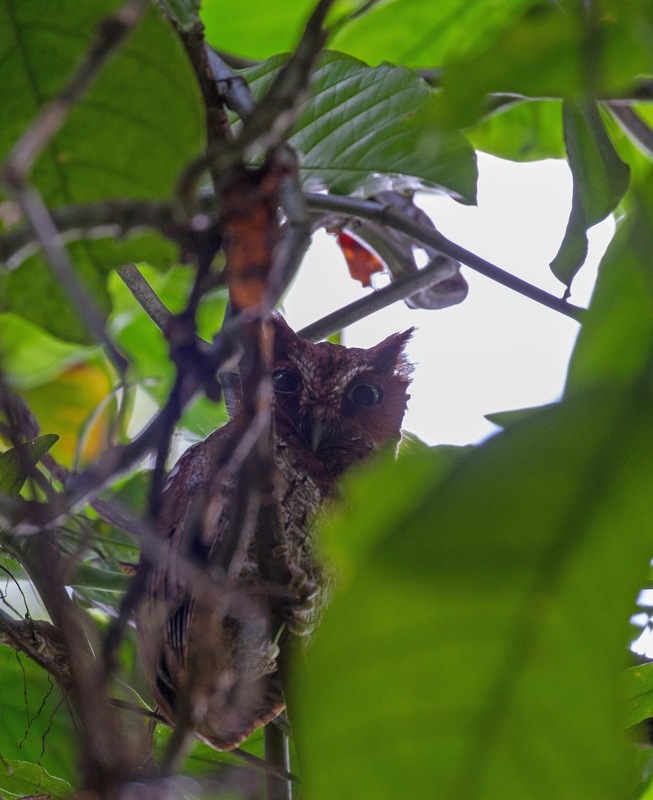 We walked the trails back at Pico Bonito Lodge and found 2 Guatemalan Screech Owls roosting under a palm tree. Can you see the ear tufts? Here is his mate hanging out in vines a few feet away from the palm tree. 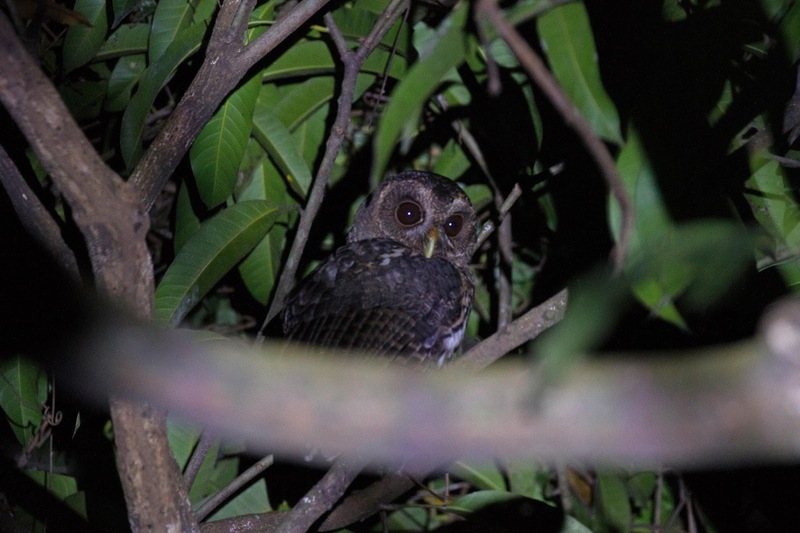 The Lodge has more owls on the property including Mottled Owl. We heard this owl calling on our first night and went out with Alex to find it another night. This was the only owl that we did not see during the day because it roosts in deep bamboo stands. Alex found it and used a flashlight to illuminate the owl. He didn't seem to mind as he went about his business of hooting and looking around while we took a quick look. I snapped this photo while the flashlight was on the bird. We headed into town one day after a bird hike for lunch. Alex took us to a local garden to seek Black and White Owls but we couldn't find them. The lady who runs the place said that she thinks the local kids chased them away. 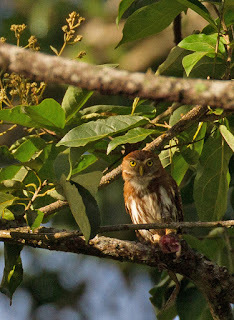 Not to be deterred, Alex knew of one more species that we could see back at the lodge - Crested Owl. 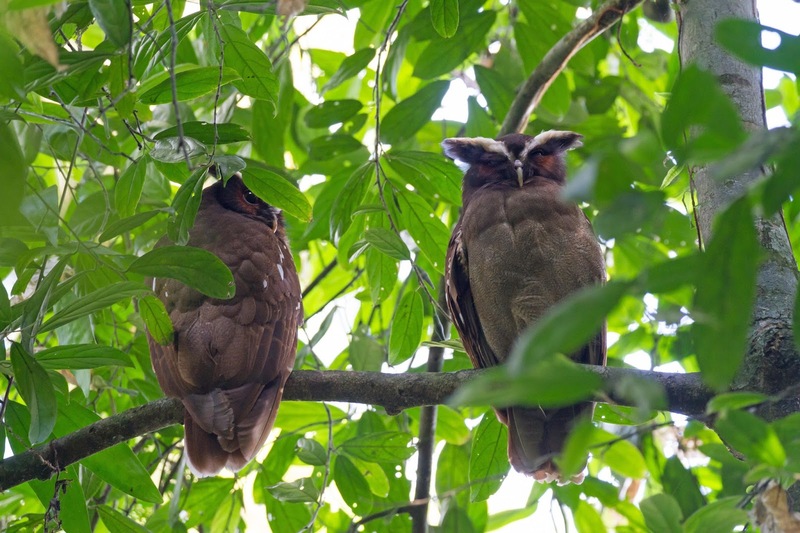 Seeing these owls required an arduous hike up a pretty steep mountain path. We called it the "Death March". It was really steep and I thought I wouldn't make it the whole way. We hiked and hiked and came to a place where the trail seemed to end at a rocky ravine. Alex told us to wait there while he scrambled up the steep rocky trail. He said that he would whistle if he found the owl. We waited. He whistled. We scrambled. 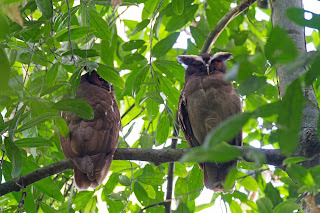 We were rewarded with a pair of Crested Owls sitting quietly above the trail. Alex climbed the embankment of the trail to get a better view in the scope. I followed. That's us sitting on the steep slope tangled with vines. Todd called us snipers on the high perch. I won't tell you about the deadly snake that was there a few minutes before . . . 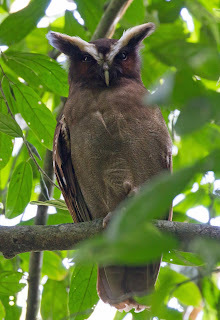 Check out the Crested Owl looking right at us. You can see that he is standing on one foot and has the other curled up. Spending time with these owls was amazing. I worry that we are bothering them but then they closed their eyes and went to sleep while we quietly slid back down the steep trail and took one last look. Five owl species was honestly 4 more than I expected on the trip but Alex wasn't done yet. Due to a change in plans later in the trip (which I will tell you about later), we ended up high in the mountains at a place called El Jilguero. 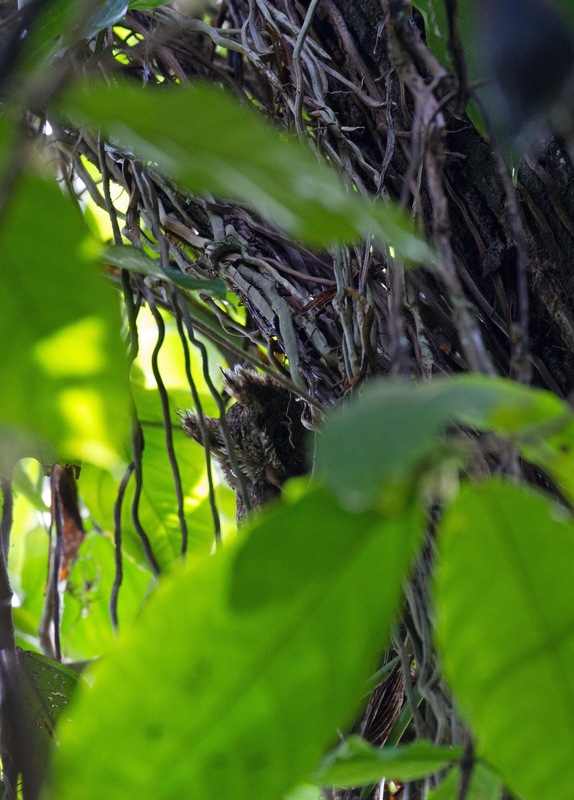 Alex knew that Fulvous Owls lived here and proceeded to call to them. 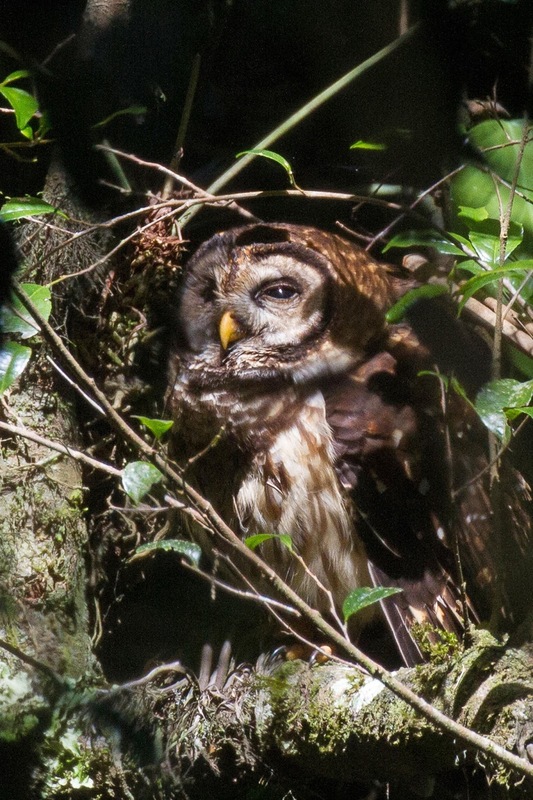 He scrambled down an embankment and found the owls. We all (well most of us) headed down to get a view. The owl sat on a large limb with just enough sunlight peeking through the forest to light him up. I said that most of us made the trip down the embankment to see the owl however, the path was too steep for Anita. She waited for us at the top but I knew that she was disappointed not to see the owl. On the way back to the top, I looked over my shoulder and saw the owl from a spot close to the top. I asked Alex to set up his scope. Todd and Paul guided Anita down the path and viola, she got to see the owl. It was an emotional moment for everyone. Here is her husband Paul handing her his hanky while she looks at the owl through tears of joy. That's what made the trip so memorable. 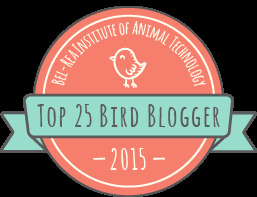 It isn't the birds, it's sharing the experience with friends both old and new. Getting to see their reaction when they finally see target species. Reminiscing about the tolerance of the owls over drinks and dinner. Laughing about how steep the climb was or how blasted hot it was on the trail. That's what we'll remember.